EZkeys is a revolutionary plugin and stand-alone instrument that combines a world-class piano player, songwriting partner, arranger and a meticulously sampled instrument – all in one package! Aside from breathtakingly rich tonal qualities, EZkeys allows the user unlimited creativity through its groundbreaking functionality. 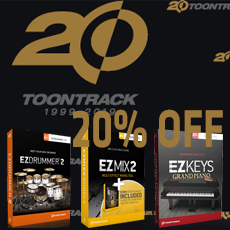 If you have registered at least one EZkeys Instrument already, you are eligible for the reduced "EZkeys Sound Expansion" to get the Electric Grand and save big! EZkeys includes a host of revolutionary and creative songwriting features. Transpose full MIDI tracks on the fly, use any MIDI file and transform it with playing styles found in other MIDI, use the groundbreaking EZkeys Chord Wheel to customize chord voicing and harmonic color with just one mouse-click – and much, much more. • Recorded at Studio 9, Sveriges Radio, Sweden through a Music Man amp and a custom-built speaker cabinet using Avalon U5, Dimension D, SELA T25, Coles 4038, Telefunken U47 and Neumann SM69 microphones. The default and all-round sound brings out the best in the natural CP-80. A true bypass preset that represents what the instrument sounds like raw, without effects and EQ. A big sound for any ambient ballad. This sound involves EQ, compression, stereo enhancer, reverb, delay and more. The direct signal run through an amp and a 15" cabinet combined with compression, spring reverb and tremolo. A well-rounded sound with a slight edge, great for anything from classic ballads to modern pop and rock. Reverb and chorus on top of the classic CP-80 produces a dense sound with subtle overtones. Tailored for ballads or mid tempo rock with an edge. Bit crusher, filter, phaser, delay and plate reverb – all boiled down to a preset that takes this instrument to a completely new level. Suitable for anything from modern pop to classic funk or rock. A bright, in-your-face sound that won´t go unnoticed in any mix. Chorus, hall reverb, tape delay, compression – this is a creative preset with an unmistakable modern edge but still timeless and applicable in any song context. Slightly less bright and with a more vintage feel, this combo of vibrato, filter and filter delay will surely find its way to many funky ballads and songs with a retro feel. Tape simulation, compression, phaser and plate reverb – a playful sound with a distinct distorted edge and phaser effect.